FILE - A National Guard troop watches over the Rio Grande River on the border in Roma, Texas, April 10, 2018. The governors of multiple East Coast states have announced that they will not deploy National Guard resources near the U.S.-Mexico border, a largely symbolic but politically significant rejection of the Trump administration's "zero-tolerance" immigration policy that has resulted in children being separated from their families. 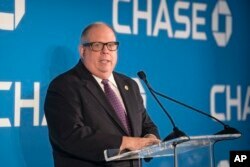 Maryland Governor Larry Hogan, a Republican, announced Tuesday morning on his Twitter account that he has ordered four crew members and a helicopter to immediately return from where they were stationed in New Mexico. FILE - Maryland Gov. Larry Hogan speaks at a luncheon in Washington, April 19, 2018. Massachusetts Governor Charlie Baker, who like Hogan is a Republican governor in a blue state, on Monday reversed a decision to send a National Guard helicopter to the border, citing the Trump administration's "cruel and inhuman" policy. On the Democratic side, governors in Connecticut, Delaware, New Jersey, Pennsylvania, Rhode Island, New York and Virginia have all indicated their refusal to send Guard resources to assist with immigration-related issues. The resources in question from each state are relatively small, so the governors' actions aren't likely to have a huge practical impact. But they are a strong symbolic political gesture, said Mileah Kromer, the director of the Sarah T. Hughes field Politics Center at Goucher College in Towson, Maryland. "I think at a time when you have a large percentage of the country questioning the leadership of the Trump administration, it certainly is a moment for the governors across the country to show leadership, particularly at a time when this is so divisive," Kromer said. The forced separation of migrant children from their parents has fueled criticism across the political spectrum and sparked nationwide protests of President Donald Trump's immigration policies. "Ever since our founding — and even before — our nation has been a beacon for families seeking freedom and yearning for a better life," Democratic New Jersey Governor Phil Murphy said Tuesday as he signed an executive order prohibiting the use of state resources. "President Trump has turned this promise on its head by doubling down on his inhumane and cruel policy of separating families." FILE - New Jersey Governor Phil Murphy speaks in Oceanport, N.J., June 14, 2018. In New York, Governor Andrew Cuomo on Monday reiterated a decision he first made earlier this year to not send Guard resources to the border to assist with immigration-related duties. He's also asked for a federal investigation of the policy relating to the separation of the children from their families. Delaware Governor John Carney, a Democrat, said he turned down a request he received Tuesday to send National Guard troops to the southwest border, while the Democratic governors of Virginia and North Carolina said they would recall Guard members and equipment they already had sent to the border. "If President Trump revokes the current inhumane policy of separating children from their parents, Delaware will be first in line to assist our sister states in securing the border," Carney said in a statement. 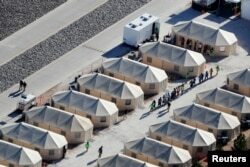 Immigrant children being housed in a tent encampment are shown walking in single-file line at the facility near the Mexican border in Tornillo, Texas, June 19, 2018. Governors are not the only ones taking action: Mayors from across the U.S. announced plans to travel to the Texas border on Thursday to protest the "zero-tolerance" policy. The mayors will gather at a point of entry near where migrant minors began arriving at a tent-like shelter last week. The U.S. Conference of Mayors last week unanimously passed a resolution registering its opposition to separating children from their families at the border.